Nugget H., a 3-year-old male, neutered, Shepherd mix who has environmental allergies complicated by bacterial infection with resistant strains of bacteria: In the nearly 8 years since Dr. Liska has practiced at ADRC, Nugget is by far the most severe, complicated, and heartbreaking patient she has treated. 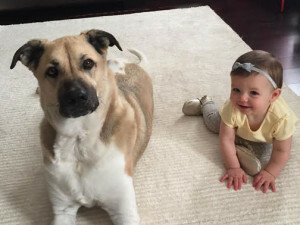 Nugget was originally allergy tested for environmental triggers in early 2014. He started ASIT injections at that time. 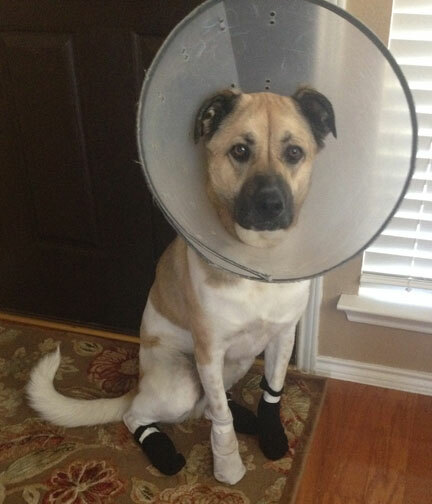 In June, he returned for a recheck when he flared with severe inflammation and infection in his paws. At that time he had, in the words of his pet parent, “uncontrollable itching, self-mutilation, infection, has to wear a cone to keep him from licking his paws, paws have to be wrapped in four layers of bandages every day, gaining weight from steroids, unable to greet us at the door or even play with his new sister”. With time, patience, perseverance and an incredibly devoted family, we slowly worked through the severe infections, conducted a hypoallergenic diet trial and now have Nugget back to his old self. He still requires allergy injections and daily medications. Because of ADRC’s dedication to his health, Nugget is now back to the loving and playful dog he once was. He is bandage, cone and infection-free. But it is important to note that this took eight months.We wanted so badly to give Nugget an immediate fix, but that wasn’t an option. It was slow and steady steps—new medication regimens, lab work, consults, and lots of crossed fingers. The progress came with a lot of patience, and we had to learn to celebrate the little victories. It was difficult not to want to give up, especially in moments where he appeared to be suffering, but I’m so glad we didn’t.It took time to heal Nugget—and the unconquerable spirit of a little dog who could make anyone his best friend. Including now, most importantly, his sister.